In 1981, New York is having its most violent year in the city’s history. Abel Morales is an immigrant with huge ambitions for his legitimate fuel transporting business, but is increasingly having difficulties with his potentially dangerous competitors. As his business grows, the District Attorney starts to take an interest, just as it seems that one of Abel’s competitors turns to a series of violent hold-ups. With a massive deal to expand onto a bigger property and a great deal of money at stake, Abel must figure out who is attempting to steal from him and sabotage his empire’s growth. Abel’s similarly driven wife Anna (Jessica Chastain) demands that he protect their family from escalating threats, potentially leading Abel to a path of violence and corruption. J.C. Chandor, director of the almost completely silent Robert Redford on a boat survival drama All is Lost, returns to the big city and to a highly dialogue driven narrative for his third film. 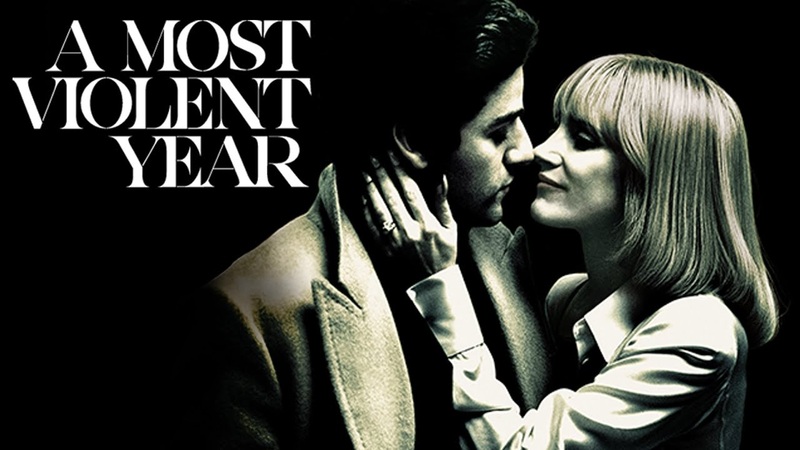 Emulating classic films from the 70s, A Most Violent Year is an incredibly mature film from a director who is unafraid to completely subvert expectations. A Most Violent Year is not really all that violent so don’t expect an action thriller with bullets flying every five minutes. Instead, it’s a smart exercise in mounting tension, when the stakes are more often financial than life-threatening. Not that you’d know it from the performances of Oscar Isaac and Jessica Chastain. Isaac is a dead ringer for Pacino in The Godfather and Chandor milks the lighting and production design to amplify the similarities between Morales and Corleone. Chastain’s Anna could have been a screeching Lady Macbeth-alike character but actually comes across as ballsy, bold and smart; a simmering complement to her ambitious husband. While A Most Violent Year has some attention grabbing sequences, including a French Connection aping car chase, it doesn’t manage to make the business of being in business as thrilling as Chandor made the world of finance in Margin Call. It’s a grown up semi-thriller and wonderfully crafted homage to classics of the 70s. But it could have done with being a more violent, exciting film.